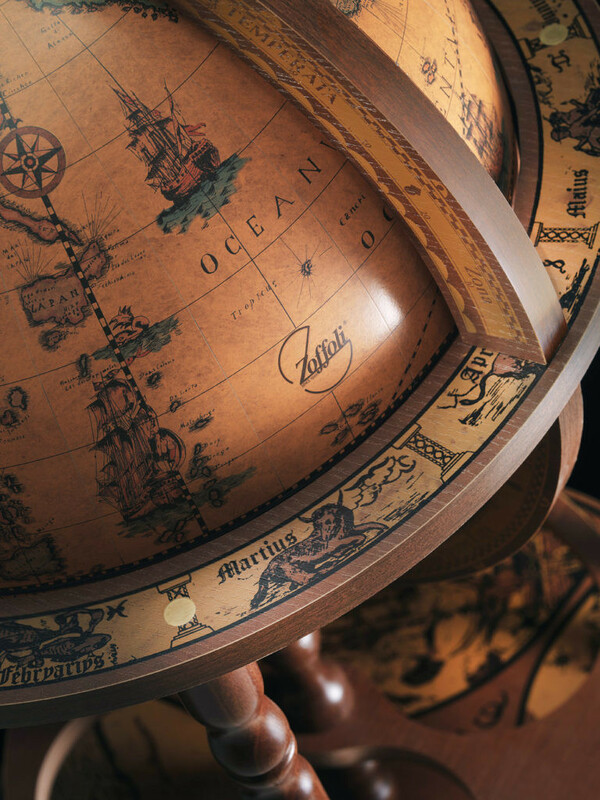 The Columbus Brown is a beautifully crafted Italian Globe Bar with 17th century antique globe ball and is named after the famous explorer Christopher Columbus. 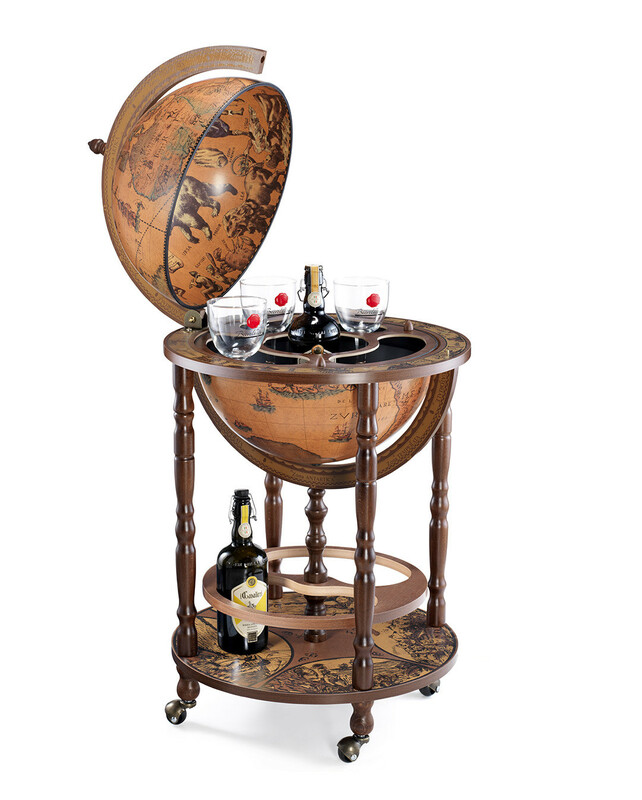 This deluxe drinks globe model can carry at least 6 bottles and 9 glasses, has always been a very popular globe drinks cabinet and is suitable for both large and small rooms. The stand is made from chestnut stained solid hardwood legs mounted to a durable veneered base. The meridian, equator ring and base are decorated by screen print images of artwork from the period. 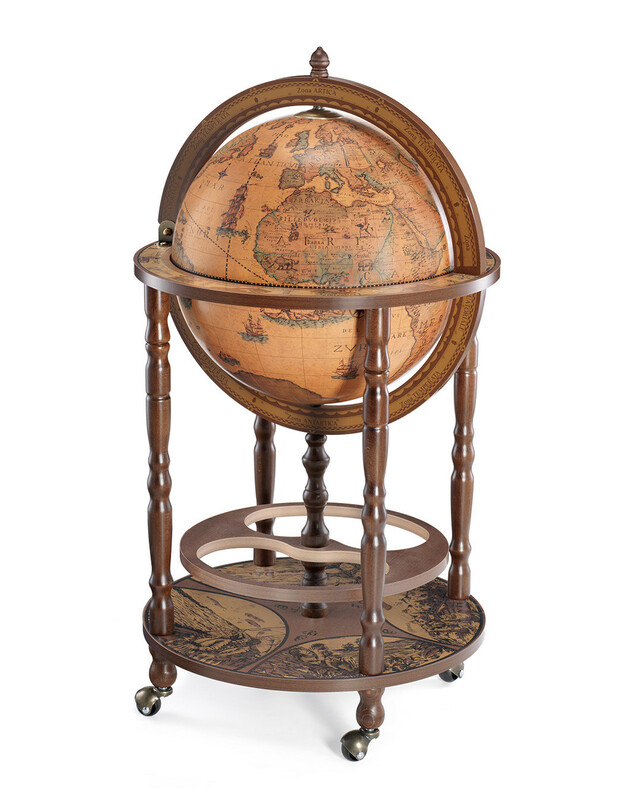 Based on a 17th century map, the Columbus bar globe is ideal for any environment and a great centre piece for any room with its 16" antique replica globe ball that rotates about the equator ring. Map designed by Pierre Duval, a french cartographer who worked for the French King Louis XIV. Exact date unknown, but it is somewhere between 1647 and 1683. A vintage feel from the 17th century old world mapping. Text hand drawn in Latin adding to the classic feel of the globe. Illustrations of 17th century ships on the oceans. Illustrations of wildlife including bears and elephants. Illustrations of buildings including the pyramids and major cities at the time. Some assembly required. Please Note : glasses and bottles are not supplied with this bar globe. Lovely gift, easy to assemble. 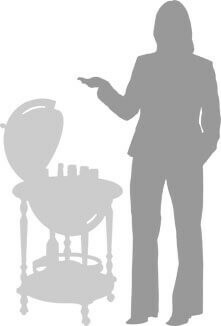 Excellent present - for the Dad who's got it all. A good quality, quite classy. Very speedy delivery.